The BJP government at the Centre received a setback from the Supreme Court on Tuesday as Chief Justice of India Ranjan Gogoi directed the CBI to not arrest Kolkata Police Commissioner Rajeev Kumar. Reacting to the development, West Bengal Chief Minister Mamata Banerjee called it a moral victory for her government in the ongoing row with the CBI. The development in the Supreme Court came as an early setback for the BJP and Prime Minister Narendra Modi since both expected the top court to allow the CBI to arrest Kumar, who’s believed to be very close to Banerjee. But, the trouble for the BJP appears to have just started ahead of its electoral battle for the Lok Sabha polls in Bengal. The recent crackdown by the CBI against the Bengal government saw several high profile opposition leaders rally around Banerjee. Notable amongst them were Congress President Rahul Gandhi, RJD’s Tejashwi Yadav, Samajwadi Party’s Akhilesh Yadav, Janata Dal Secular’s HD Kumaraswamy, MNS Supremo Raj Thackeray and Delhi Chief Minister Arvind Kejriwal. The BJP has been projected to win significantly fewer seats in this year’s Lok Sabha polls than what it won five years ago. According to at least four opinion polls, the BJP-led NDA is unlikely to secure an absolute majority in the parliament, making Modi’s dream of becoming India’s prime minister for the second time incredibly difficult. Modi and his party had set their sight on West Bengal to make up for the predicted deficit that the BJP may suffer in states such as Uttar Pradesh, Rajasthan, Madhya Pradesh, Chhattisgarh and Gujarat. The BJP was hoping to take advantage of the split in secular votes in Bengal since there were no possibilities of the TMC and the Congress coming together in the Lok Sabha polls up until now. But, with Banerjee hinting at a possible tie-up with the Congress, the BJP’s trouble has deepened in Bengal. 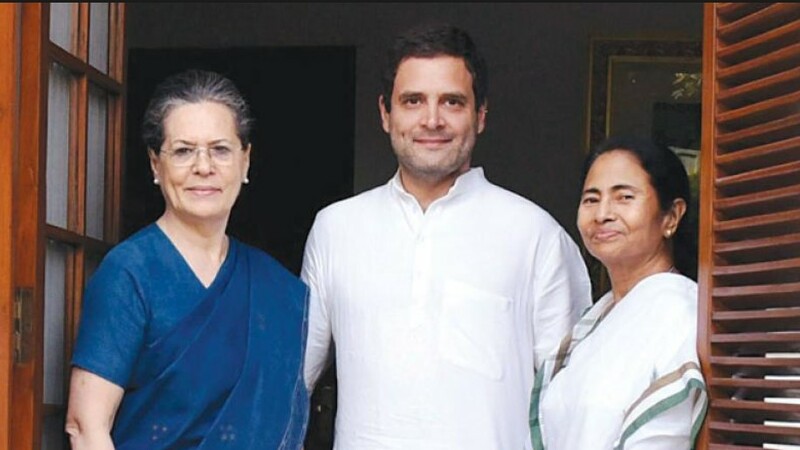 Banerjee’s comments hinting at working with the Congress at the national level may also be seen as her approval for Rahul Gandhi’s candidature for the prime minister’s post.